November | 2013 | Whats Happening? This year, the Winston-Salem Symphony under the baton of Music Director Robert Moody, invites you to enjoy a brand new, exhilarating holiday musical tradition entitled “Carolina Christmas Spectacular!” The concerts will take place on Saturday, November 30 at 2:00 p.m. and 7:30 p.m. and Sunday, December 1 at 2:00 p.m. at Reynolds Auditorium, 301 N. Hawthorne Road in Winston-Salem. Tickets range from an affordable $25 to $65 for adults and $25 to $40 for children 2 and up and are available in advance by calling the Symphony Box Office at 336-464-0145 or online at WSsymphony.org. This concert is part of the Winston-Salem Symphony’s Angel Tree partnership with the Salvation Army. Concert goers are encouraged to donate new unwrapped toys for children up to age 12 at the concerts. The toys will be distributed through The Salvation Army’s Christmas Program. The Winston-Salem Symphony’s “Carolina Christmas Spectacular!” is the perfect way to get immersed in the spirit of the season. This new concert offering includes a selection of popular and beloved secular and religious music. Joining the orchestra and Symphony Chorale are guest artists Cirque de la Symphonie, whose aerialists will add to the festive holiday spectacle with their dramatic feats above the orchestra, and Winston-Salem State University’s phenomenal Burke Singers. “Carolina Christmas Spectacular!” will take concert goers through a musical journey of holiday music starting with the traditions of the holidays (including Simple Holiday Joys, A Holiday Melody, Little Bolero Boy, “Waltz of the Flowers” from The Nutcracker and more) progressing through the story of the holiday (The First Noel, The Rose, Lo, how a rose e’re blooming, Hallelujah! from the Messiah and more) and ending with the spirit of the holiday (Sleigh Ride, Christmas Sing-a-Long, Let there be Peace on Earth and more). Cirque de la Symphonie is an exciting production designed to bring the magic of cirque to the music hall. Cirque de la Symphonie is the only cirque company in the world that performs exclusively with symphony orchestras. Over one hundred orchestras worldwide have featured Cirque de la Symphonie in sold-out venues, adding energy and excitement to the concert experience. The Winston-Salem State University Burke Singers are a female a cappella vocal ensemble founded on the campus of Winston-Salem State University in March 1995 by D’Walla Simmons Burke, Director of Choirs and Vocal Studies. She saw a need to add variety, emotion, and a sense of political awareness to the choral program and to the city of Winston-Salem. More than just a vocal ensemble, the Burke Singers inspire listeners to experience songs of old in a new way. The Winston-Salem Symphony Chorale is comprised of 90 auditioned singers and is directed by Dr. Carole J. Ott. The group performs several times each year with the Winston-Salem Symphony. Come out and join Ray Publishing and FOX8 news anchors for Sealy FOX8 Holiday Concert featuring festive holiday favorites. Includes a carol sing-along sure to put you in the holiday spirit! Parking and concert are FREE with a donation of canned food or non-perishable food items, which will be distributed to Salvation Army Food Banks throughout the Piedmont. The 2013 dates for the annual Sealy FOX8 Holiday Concerts have been announced. The Winston-Salem concert will be held at Joel Coliseum on Saturday, Dec. 14 at 7 p.m. The Greensboro concert will be held at the Greensboro Coliseum on Dec. 15. at 5 p.m. Doors open at 3:30 p.m. The Burlington concert will be held at Williams High School Auditorium on Dec. 20 at 7 p.m.
Want to give that shopping experience a greater perspective this Christmas? 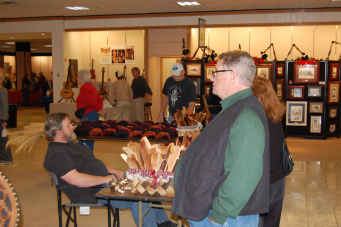 HIGH POINT, N.C. — The Roy’s Folks Crafts Fair will be held November 22-23 in High Point. The annual fair will be held in the old J.C. Penney location at Oak Hollow Mall on November 22 from 7 a.m. to 6 p.m. and November 23 from 10 a.m. to 6 p.m.
WINSTON-SALEM, N.C. — Winston-Salem’s Patrick Boyles has researched the events surrounding the assassination of President John F. Kennedy since he saw a magazine article about the tragedy as a teenager. Boyles was a 6-year-old first-grader at Moore Elementary School when Kennedy was killed Nov. 22, 1963. A few years later, he saw a magazine article about the assassination that stimulated his interest in the event. Since then, Boyles has collected boxes full of newspapers, magazine articles and nearly 200 books about the topic. Boyles first traveled to Dallas in 1984 and visited the homes of Kennedy’s accused killer, Lee Harvey Oswald, and Oswald’s convicted killer, Jack Ruby. Boyles has spoken to people who saw the shooting 50 years ago. 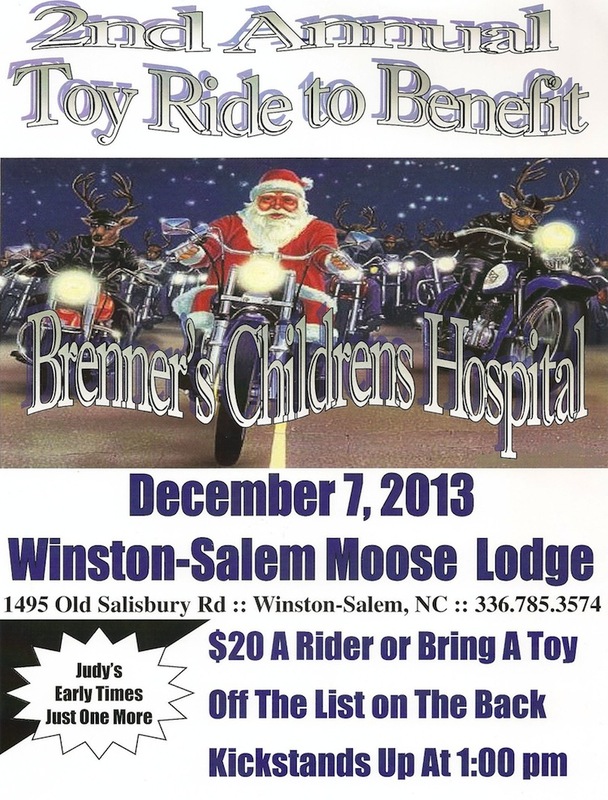 The Winston Salem Moose Riders are happy to team up with Critical Children at Christmas to collect toys for children that are in the hospital during the Christmas Holiday. $20 a rider or bring a toy, food, raffles, best and worst hand, and live music by Cold Heart. KSU 1:00 from the Winston Salem Moose Lodge then riding to Judy’s Place Too, Early Times Bar and Just One More Tavern, then back the W-S Moose Lodge. Can’t wait to see you there!!!! Please see toy list for toys that we will be collecting. Cold Heart is looking forward to rockin the Toy Drive event. Please everyone plan to join us for a great cause and help make a child’s Christmas a Merry one! If you ride join the poker run, if not then make plans to be at the WS Moose Lodge by 4pm. We will get the rock and roll going as soon as the riders are back from the poker run. You don’t have to be a Moose Member to join in the fun! So bring yourself, and a toy for the drive and spend Saturday afternoon, Dec 7th with us! 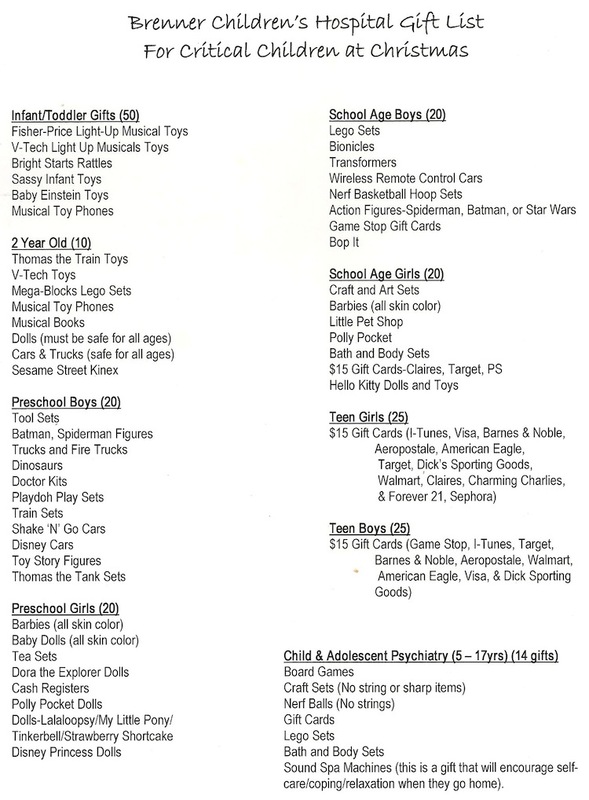 see the list of toys that Brenner Children’s Hospital is in need of. Beer is becoming big business for downtown Winston-Salem. WINSTON-SALEM, N.C. — Beer is becoming big business for downtown Winston-Salem. North Carolina now has nearly 90 breweries — the most of any state in the Southeast. Two more are opening up in downtown Winston-Salem and giving downtown a unique character, as Brent Campbell explains. Annual Roy’s Folks Craft Fair Coming Soon! This Christmas season will be here before you know it so make your calendars now for the Annual Roy’s Folks Craft Fair on Friday, November 22 and Saturday, November 24. The event will be held at old JC Penney at Oak Hollow Mall. The fair will run from 7 a.m. to 6 p.m. Roy’s Folks features more than 75 vendors, all who have been featured on one of Fox 8 WGHP’s Roy’s Folks segments. The crafts range from handmade yo-yo’s, rocking chairs, jewelry, pottery, fine art, glass and metal artistry, and more! The fair is unique among other events of its type. All of the money raised from the entry fee benefits Fox 8 WGHP’s Gifts for Kids program–specifically toys for High Point. Visitors can enjoy local beers and wines and diverse dining and nightlife in Winston-Salem, N.C., which Livability.com named one of the nation’s best downtowns. – A Veterans Day Ceremony will be held in King Central Park, 302 Kirby Road in King. Billy Joe Joyce, a U.S. Army veteran, will be the guest speaker. A selection of patriotic music will be played at the Central Park Amphitheater starting at 10:15 a.m., with a performance by the West Stokes High School Band followed by musician Taylor Vaden, a Stokes County native. A dedication ceremony will be held at the Veterans Memorial site at 11 a.m. with music by Robbie Voss and Eric Marshall. Eagle Scout Cody McBride will present the Military Dog Memorial Dedication. – A Veterans Day ceremony will be held from 11 a.m. to noon in Perrit Plaza on the Wake Forest University campus to honor all military veterans. Call (336) 758-5545 for more information.